Visiting Santorini wineries is a popular activity on this Greek island in the Cyclades, whose volcanic soil provides a distinctive terroir. 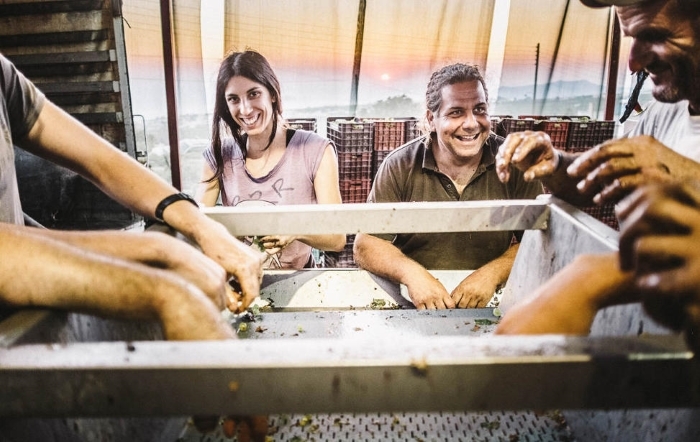 Wine-making is not an activity that many people associate with the Greek islands, but several islands are noted for their wines and vineyards including Crete, Samos and Santorini. All three have a long history of winemaking, with Crete being very highly-rated recently by Wine Enthusiast magazine. Samos makes some of the best dessert wines in the world and provides the grapes to Metaxa for making their unique Greek brandy-style spirit. 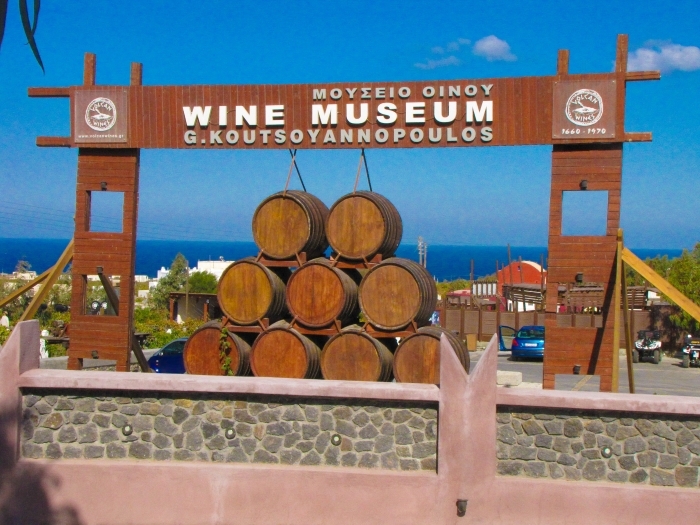 The Canava Roussos winery in Episkopi is the oldest of the current wineries on Santorini, looked after now by the 4th generation of the same family. There's a free winery tour but naturally a charge for the wine-tasting. 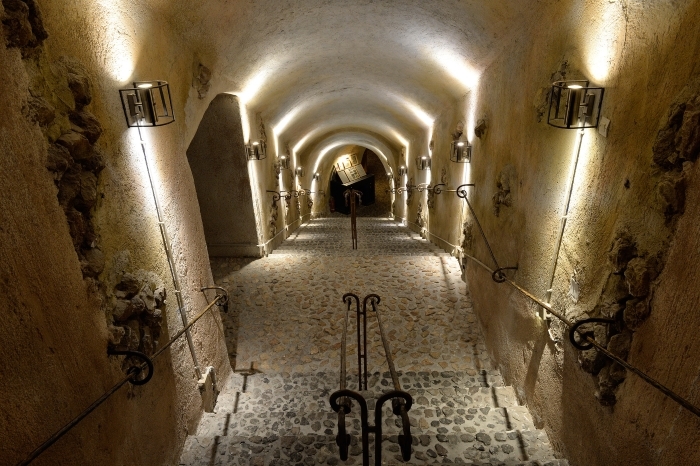 Volcan Wines is between Messaria and Kamari and in addition to the self-guided tour there are wine-tastings and an underground wine museum. Boutari is one of the best-known names in Greek wine and they have one of the best winery visits on Santorini. The presentation here will teach you a lot about Santorini wines generally, and Boutari makes a great variety of wines, which you can sample. You'll find it in Megalohori, where you'll also find the much smaller but charming Gavalas Winery. Near Pirgos there are some more wineries to visit, including the Argyros Estate in the village of Mesa Gonia, east of Pirgos. They aren't open for visitors but will show you around and give you a tasting if you phone them in advance (tel: 22860-31489). The same applies to the Hatzidakis Haridimos Winery which is on the road that leads from Pirgos to the Profitis Ilias Monastery (tel: 22860-32552). There has been wine-making on Santorini for as long as records exist, but it became especially popular when the Venetians ruled the island and began exporting Santorini wines to Italy and other parts of Europe. 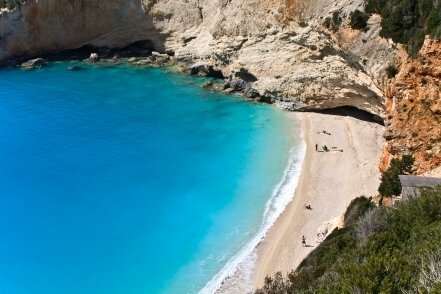 The famous Italian sweet wine Vin Santo gets its name from Santorini, and you can try a similar wine on Santorini itself where it is called Vinsanto. The volcanic nature of the soil is good for producing crisp white wines, and when you're visiting Santorini you'll notice grape varieties you may not have heard of before. The three most popular Greek white grape varieties on Santorini are Assyrtiko, Athiri and Aidani. In fact about two-thirds of the island's vineyards are planted with Assyrtiko, so you'll see that on a lot of menus. The two most popular Greek red grapes on Santorini are Mandalieria and Mavrotragano. You'll also find some blended wines, some rosé wines, and some wines made from imported vines that have more familiar names to visitors. You can organise your own visits to Santorini's wineries but you will need a car as they are spread out around the island. This is one case where we'd recommend joining an organised tour, so that you don't have to worry about drinking and driving. The tour companies also know the best options. Two of the wineries have great views of the caldera, so taking a sunset wine tour ensures you end up at one of these places for a wine tasting with spectacular views. If you're happy to pay a little bit more you can also have a private tour, otherwise you can book a small group tour, which usually lasts a half-day. Another option is to do a general island tour which includes a stop at one of the wineries on the way. There are also gastronomy tours which include wineries, breweries, restaurants and food producers. One thing to be aware of is that Santorini wine tours are increasingly popular and because they are limited in size they tend to fill up quickly. If it's something you really want to do, book that tour as soon as you arrive. Your hotel or any travel agency will be able to help.